© 2005 Pate-Meadows Designs, Inc. This unique valance is a casual take on a formal style and can be adapted to fit any size window. "Loose" fabrics, cottons, linens, light-weight polys and silks are great for this design, to minimize bulk at the ties and to flow and drape well. The finished length of the valance is approximately 21-1/2" at the swag, 18" at the middle horn and 32" at the side jabot. The curtain valance shown in the photograph is mounted on a wooden rod with rings; however, it can be adapted to hang independently from decorative finials mounted to the wall. Please read all instructions before beginning. Instructions are for a valance that is 36-44” finished width. The information needed to add to or reduce the width is included. The finished length of the valance is approximately 21 ½” at the swag, 17” at the middle jabot and 32” at the side jabots. The jabots are lined in a contrasting fabric. A facing made with decorative fabric is used along the bottom edge of the swag lining so that ivory/white lining does show to the front. 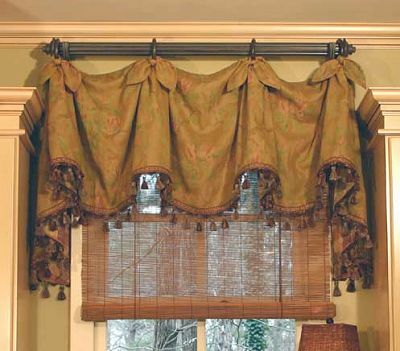 This valance works best when constructed out of a medium-weight decorative fabric. Drapery interlining is recommended, giving the valance better shaping and the color of the contrasting fabric does not bleed through to the face fabric when sun shines through the valance. These amounts are for a valance measuring 36-44” finished, installed width. See chart for other widths. These amounts are based on 54” wide fabric.